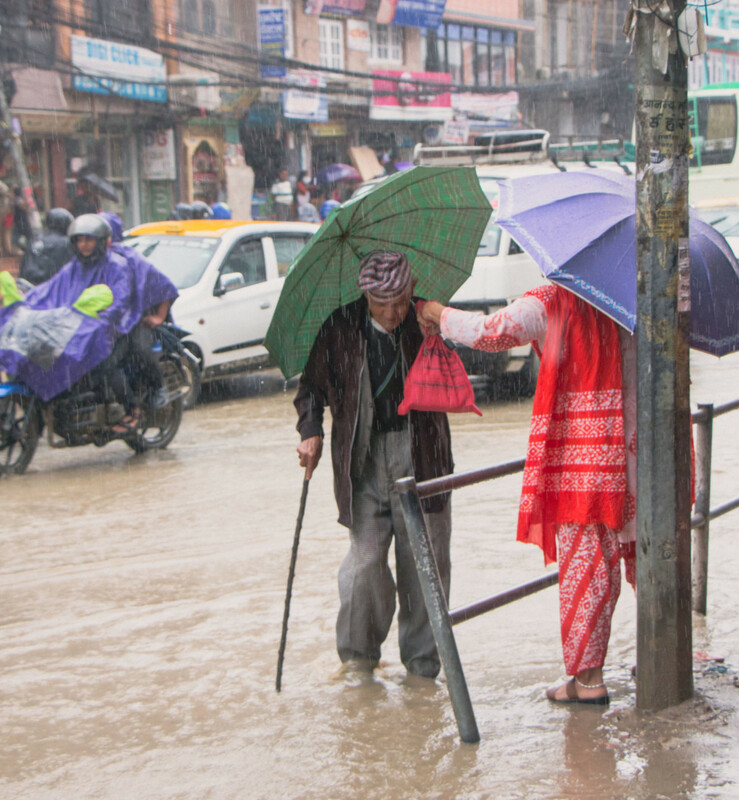 Monsoon in Nepal 2018:Heavy rainfall affecting the lives of people! Heavy rainfall affecting the lives of people: Monsoon in Nepal 2018! Monsoon is the seasonal reversal of the direction of winds along the shores of the Indian Ocean, especially in the Arabian Sea, which blows from the southwest for half of the year and from the northeast for the other half. It is one of the oldest and most anticipated weather phenomena and an economically important pattern every year from June through September, but it is only partly understood and notoriously difficult to predict. 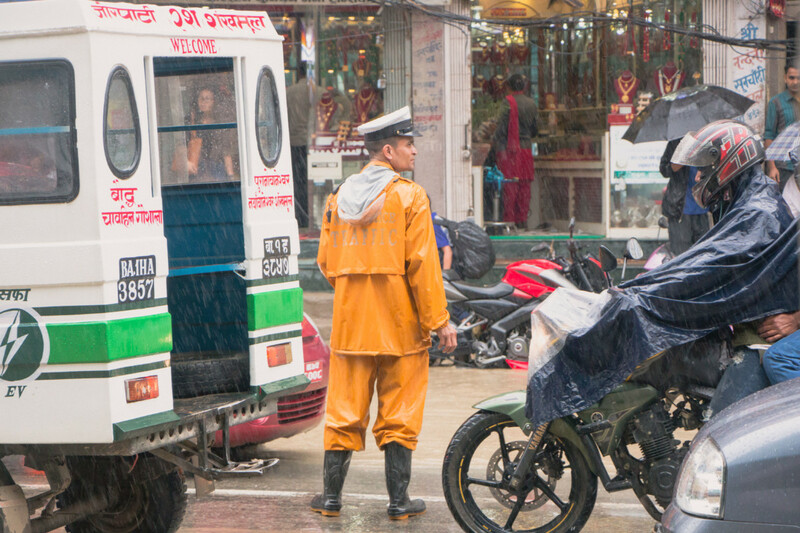 In Nepal, Monsoon usually starts at Mid of June and then lasts until late September. The seasonal rains make it possible for agriculture, forests, and inhabitants of the region to store water for the next dry cycle of the climate. The monsoon season also brings lower temperatures after the summer. Monsoon is the backbone of Nepal’s agricultural sector—which accounts for about 29 percent of the Rs2.6-trillion economy—as two-thirds of the country’s cultivable land lacks round-the-year irrigation facility. The monsoon season in Nepal has already begun and I was really excited about it. I enjoy bicycling, walking in the rain. However, it’s not the same case with millions of people residing here in Kathmandu and other parts of the country. It has been a huge pain in the daily lives of people specially to those who depend on daily wages. Outburst of drainage system, difficulty in walking (last year one of the school kids got drowned while returning home), vehicles getting trapped in a pool of rain, traffic jam for hours, vehicles splashing muddy water to pedestrians (sometimes intentionally and rest of the times unintentionally) are some of the many problems to be faced during the monsoon season. Today, while I was returning to Nayabasti, Jorpati from Putalisadak, it rained heavily. 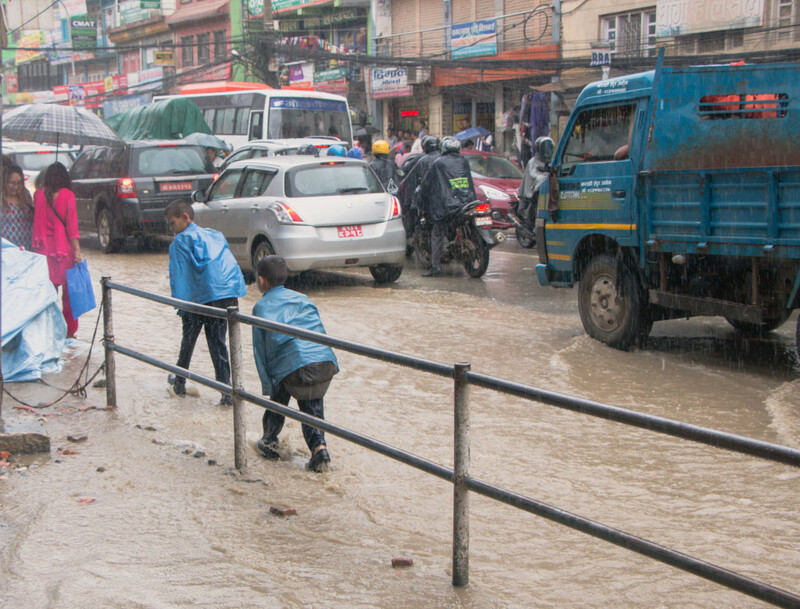 Heavy Rain affecting Chabahil and Boudha used to be subject of discussion during the monsoon time. As it was the case with the monsoon in 2017 and also the monsoon in 2016, the impacts were severe. I had witnessed them a few times during the evening time and today I wanted to observe during the day. Plus, I had carried my camera with me today. First and foremost, the Modi effect has already disappeared within a span of a few months. 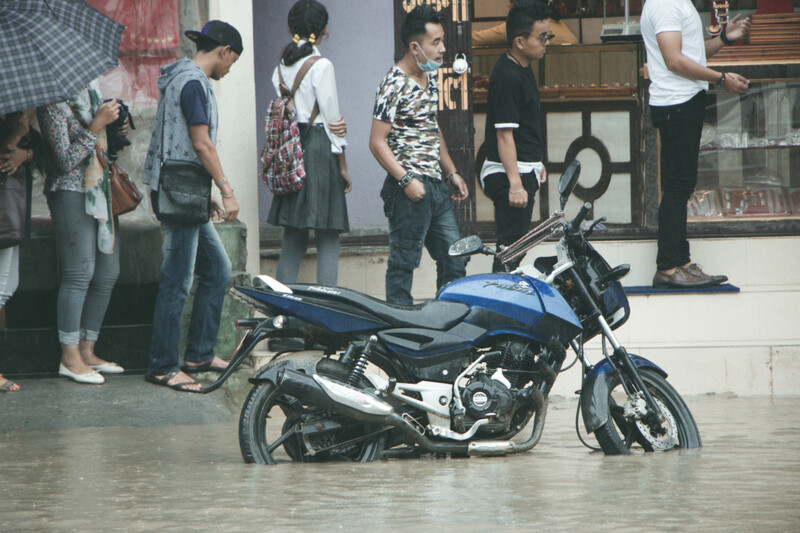 The blacktopped roads until Hyatt Regency in Chabahil-Boudha section has already turned into muddy pools. Whether it is a short or a long distance trip, people have a hard time because of slippery roads. People have become used to these things that they feel like it’s an inevitable part of our life. Roads full of dust have been substituted by dirt and ditch due to monsoon. One of the funny yet saddest things that we are well acquainted is; the development and construction works are hurried during the monsoon season which is also the end of the fiscal year. What a tragedy! Further Reading: Is Kathmandu a livable city? Here’s the photo-blog of people being affected because of ongoing Monsoon and haphazardly maintained road at Boudha- Chabahil section! School kids drenched in heavy rainfall returning to their home and a long queue of stranded vehicles after traffic gets disturbed. A school kid walks with the support of railings after being soaked in heavy rainfall today. I wonder what happened to his books, leather shoes(which are regarded mandatory in school uniform) and his health too. Is he okay? Or already suffering from a cold? I wish everything is fine. The traffic police were having very difficult times managing traffic congestion. A lot of vehicles were seen parked randomly and moreover numerous drivers were stubborn which resulted in haphazard stoppage of public vehicles. This contributed to traffic jam affecting everyone’s schedule. Young girls trying to escape potholes, jumping here and there to get to other side of the roads. Smiling amidst the hardship! A huge salute and respect. A young guy carrying his slippers tries to cross the road. The purpose of doing this is to not lose slippers. Sometimes fast flowing water might dismiss the slippers. Sad but true! 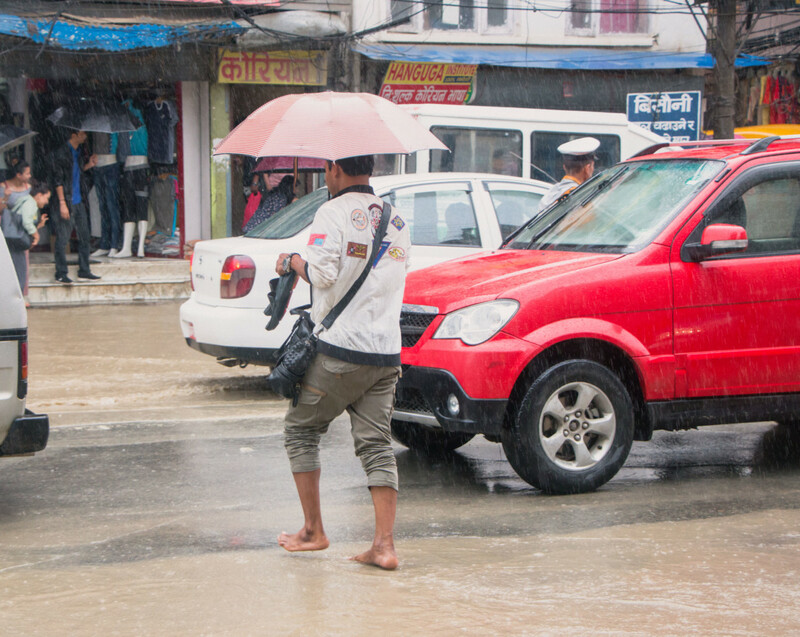 An adolescent girl carrying her leather shoes trying to protect them from being completely soaked. This picture is kind of emotional. Let’s put ourselves in the character of this girl. And imagine how difficult has it been for her to go to school and study. It’s just a matter of study and still we can feel the struggle. Isn’t it? ~The lost identity!~ As mentioned above, the slippers and shoes might get carried away by fast-flowing rainfall and this is an example. Where could another one have been transported to? ~Struggle is REAL!~ This smiling young girl was courageous and spacious enough (emotionally spacious I mean, generous) to occupy two other friends within that umbrella and at the same time protecting bags from getting wet. At this moment of time, I remembered a quote which used to be spoken during almost all the speeches delivered in school life; Where there is a will, there is a way! And this is a perfect example which carries its true essence. A motorbike gets stranded on the road and is already half-immersed. Will the owner be able to find his bike if it rains for some 30-45 minutes more? I doubt! On the background, people trying to avoid getting trapped in the pool of water. A Fruit seller keeps himself aside in the pursuit of avoiding rain and sells Mangoes. Street vendors as such are seriously hampered because of Monsoon. Monsoon affecting the street vendors real hard. 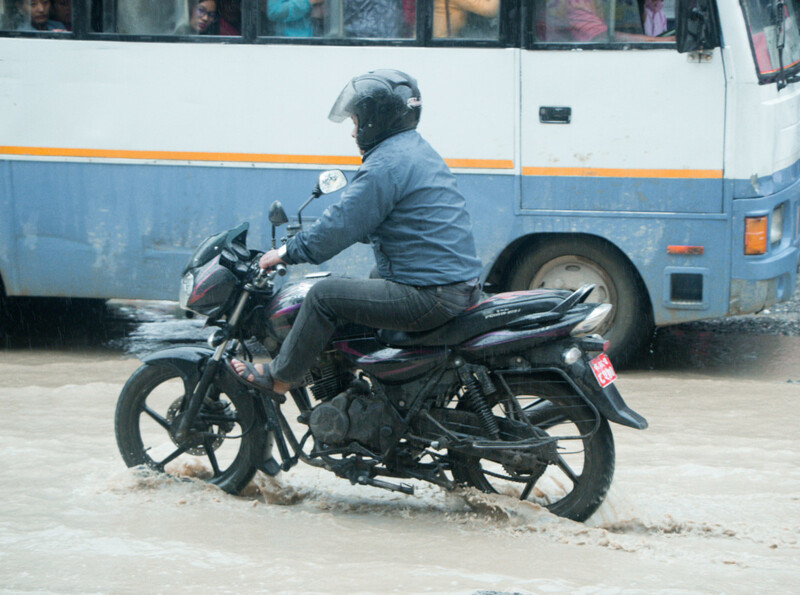 A bike rider lifts his legs up to protect himself from drainage mixed water on the roads. A woman traffic police on the middle of road managing traffic congestion at Boudha.